It’s no secret that in addition to traditional television, viewers also have access to a plethora of subscription video on demand content and virtual multi-channel providers. As the options for these streaming services have grown, so have the means by which viewers can view them on their TV screens. Consumers, in turn, are taking action. According to Nielsen’s Q2 2017 Total Audience Report, 58.7% of TV homes in the U.S. now own at least one internet-enabled device capable of streaming to a TV set. The emergence of such devices is satiating consumers’ desire to access content with the press of a button. Never have viewers had so many options to connect to streaming content on their television set. Whether it be an enabled multimedia device (such as an Apple TV, Google Chromecast, Amazon Fire TV or Roku), game console, or smart TV, nearly 70 million TV households in the U.S. have access to at least one. In fact, the penetration for such devices has grown by 12% since June 2016! Like their overall media habits, consumers seemingly like to have a buffet of options when it comes to their internet-enabled devices. 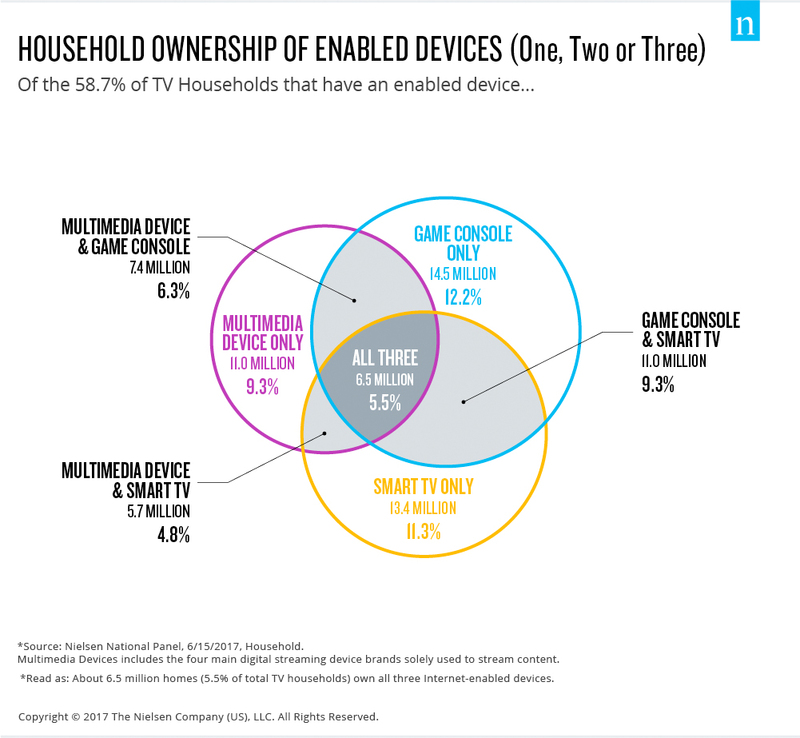 Of the 69.5 million TV homes with at least an enabled multimedia device, game console, or smart TV, 6.5 million of them have access to all three. Smart TVs in particular are increasingly approaching ubiquity and becoming more accessible to the average consumer, as one-third of TV homes now have one of these conveniently internet-enabled television sets. Once thought of as mechanisms used solely to play the latest video game release, internet-enabled game consoles (a subset of all game consoles) have become a key platform through which consumers can stream the latest SVOD content. Such devices can now be found in at least 39 million TV homes—over a third of all TV homes. Overall, more than a quarter of all TV homes (about 31 million) have at least two devices with the ability to stream content on a TV screen. A common profile of these high-tech homes is emerging as well. Homes with internet-enabled devices tend to be young, employed and affluent—characteristics that marketers and advertisers crave in an audience. Nearly half of enabled-device homes are under the age of 45. Enabled-device homes are more likely to have children and have a median income of about $70.5K. About 76% of such homes have people in the workforce, a majority of which work in white-collar occupations. When looking at race/ethnicity, such homes also have a larger proportion of Hispanics and Asian Americans. Hispanic homes tend to have enabled game consoles and smart TVs, as both of these devices have double digit penetration percentages for the individual device only, as well as the highest penetration percentage (12.2%) for both devices simultaneously across race and ethnicity. Asian-American homes tend to embrace enabled-device technology, as over 75% of Asian-American TV households have at least one device. Not only do consumers own more devices than ever before, they're also putting them to good use as adults have been spending more time with devices overall. 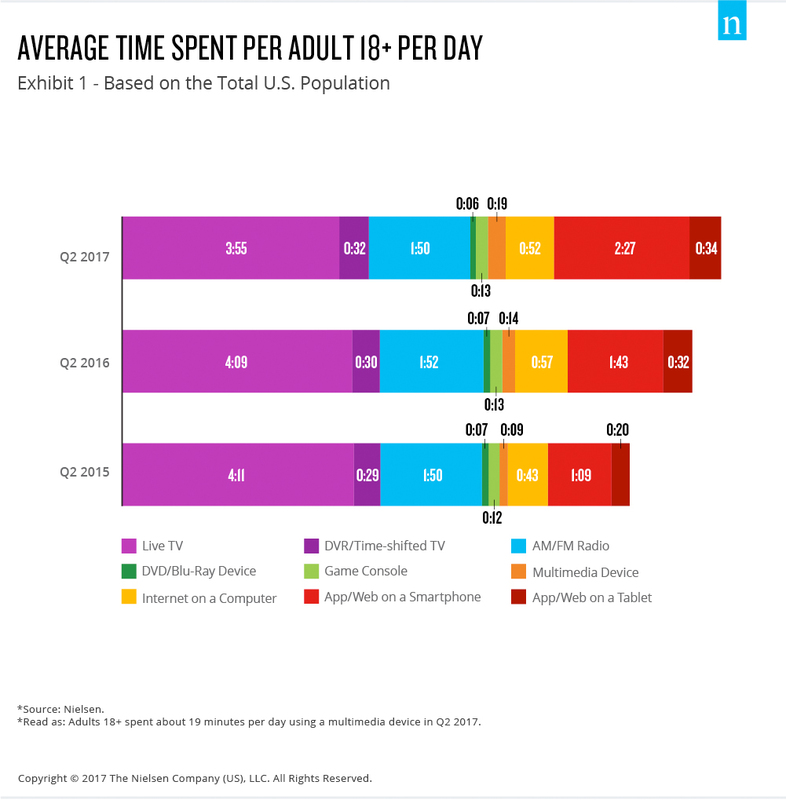 Daily time spent for adults in the total population on overall multimedia devices increased in second-quarter 2017, continuing a trend seen from the second quarter of 2015 to the second quarter of 2016. While time spent on all game consoles remained flat, usage of apps and the web on a smartphone or tablet saw notable lifts in time spent. Overall, media usage increased by half an hour in the second quarter of 2017. Current trends point to the increased adoption of newer technologies in TV homes, especially as internet-enabled devices become more widely available and increasingly more useful. With their ability to easily connect users with streaming services, these devices are vital in the effort to provide consumers with both traditionally linear and exclusively streaming content when they want and how they want, all from the comfort of the TV screen.